Is this stock a short candidate? Could we buy puts here? Price violates the 50-d m.a. Price violates the 200-d m.a. Price fails to recover the 200-d m.a. The 50-d m.a. crosses below the 200-d m.a. I have screened the stock numerous times as a strong buy as it trended higher from the initial coverage on August 11, 2005 at $9.41 but the outlook has changed. It had a great run; I never actually bought and was pissed because it could have been the perfect stock for my wife (as explained in the December post) and is now setting up a classic longer term short pattern. Should I take the trade? I may just leave this one alone because I feel a bit of revenge as I write. I missed the huge gain but covered it the entire time (that hurts). I see the potential for a short but I could be wearing blinders so I will present this for anyone else that may want a short trade. Longer term puts may do the job here. Let me know your thoughts and have a great weekend! looks like its approaching some support down at 15 (is that right? ), interesting to see if it holds that. You are right, its a very tempting short for Puts or a spread. 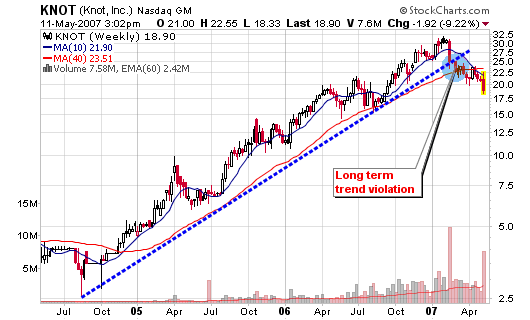 I do see support above $15 but the long term trend does suggest a seller’s market with this stock. Again, I don’t have a position established so take it as you will. Let me know if you do a spread. Also, would you be willing to write an article on the blog about your strategy with spreads? You can e-mail me if you would like to talk about this further. I’d be afraid to short this one because of sentiment reasons. I think it will always get undue attention because of the nature of the business. I was a huge fan of KNOT for that run-up you pointed out. I am out of KNOT. I think the fundamentals are terrific still. What I don’t understand is why it is KNOT finding support and just keeps trending down. ??? It’s tried to rally to the 50-day three times since the top, and this latest one is the latest failure. If I recall correctly, that’s a good time to short according to O’Neil’s books. I’d like to see it rally on weak volume to or slightly above the 50 moving average before thinking of shorting it. Support looks to be in the 15-17 level. That is probably a good place to iniate a long position. The uptrend line has been severely broken. RSI is still not at an oversold level. There may be a short term bounce back to $20-21. There is likely to be a test of atleast 16-17 before this stock bases and starts to move back up. KNOT is worth shorting on a bounce back to 20-21 on lighter volume. 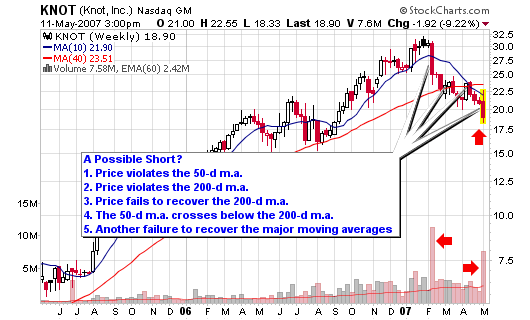 I wouldn’t want to short at this level because there appears to be a sizeable short position in the stock. A short squeeze is always a possibility. Chris, what do you think of NTRI ? Looks to be a very promising cup and handle formation on the daily chart. I also like the volume on the up days. 50 day MA is likely to move above the 200 day MA in a week or so which is pretty bullish from a technical stand point.